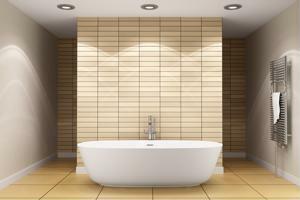 Many bathtubs have notable places in the history of the world. No, really! Be it American history, rock music or science - when certain individuals took baths, the course of humanity's fate was altered in major ways. Of course, what was once thought to be one of the most important bathtubs in American history can now be considered significant for completely different reasons. According to Legal Underground and a handful of other sources, infamous Baltimore newspaperman H.L. Mencken wrote a story in 1917 that pointed to Millard Fillmore's bathtub in the White House as the first tub to be installed in the nation. Other "facts" included in the story pertained to how bathtubs were slow to catch on in the U.S. due to doctors' worries about health risks. Of course, bathtubs were around before Fillmore, and no members of the medical community ever expressed any worries about taking a bath. "What the actual history of the bathtub may be I don't know," said Mencken many years later, according to LewRockwell.com. "Digging it out would be a dreadful job, and the result, after all that labor, would probably be a string of banalities." The source continues to explain how Mencken deeply regretted writing the story, as bits and pieces of his completely made-up but entertaining history of the bathtub went on to appear in other newspapers, textbooks and academic research papers. It could be said that we have bathtubs to thank for our ability to use science to measure volume. As the legend goes, one of the greatest thinkers to come out of Ancient Greece, Archimedes, noticed that when he stepped into his bathtub, the water rose in proportion to his size. Upon realizing he could use the displacement of water to determine volume, he mythically shouted "Eureka!" According to MentalFloss.com, he went on to prove the emperor's crown was not made out of pure gold by comparing its volume to an object with a volume equal to the amount of pure gold the crown was purported to contain. MentalFloss also re-documents an instance from 1943, when the 32nd U.S. President, Franklin D. Roosevelt, needed a navy battleship to give him a lift to conferences in Cairo, Egypt and Tehran. Navy battleships at the time did not have bathtubs installed, but one was put in specially for F.D.R. One of the worst kept national security secrets of that era was that the President had lost the use of his legs. Therefore, he needed a means to get clean other than taking a shower.